Roundtable discussants: Carolina Lee, Ahmed, Sanmati, Tom, Matt, Liz and Angela Mitropoulos. LIZ: “When people say it is “strategic” to focus on children and demand the release of families, the question must be asked, what is the strategy and for whom is it strategic to do this? Fairfax is of course a shareholder in Transfield/Broadspectrum, through fund manager Allan Gray, a fact not disclosed by GetUp. GetUp launched this latest iteration of the kids out campaign, in Fairfax newspapers in 2015, notably with the assistance of two Fairfax reporters who have specialised in hysterical reporting of alleged visa fraud among Afghans and Somalis. The impact of this reporting and the pressure to “do something!” about these terrible fraudsters is now being felt by previous and current generations of refugees in Australia whose citizenship applications, family reunion applications are jeopardised while alleged document fraud is investigated. The alleged document fraud is of course largely a result of civil identification systems in these countries having been systematically destroyed during foreign invasion and civil conflict, but the reporting from McKenzie and Baker neatly conflates passport and identification document problems with the spectre of terrorists among these specific black and Muslim men from what the industry would call “refugee-producing” countries. This reporting, relying heavily on research from notorious nationalist academic Bob Birrell and his Centre for Population and Urban Research at Monash University, who have dedicated their academic lives to the pursuit of insufficiently productive foreigners (particularly family visa entrants and “dodgy” international students), has led to very real dire consequences for current and former refugees who are yet to become citizens. GetUp’s NBIA fits perfectly within this racist framework in which black, brown and Muslim men are guilty until proven innocent. This is the racist logic of the “kids out” campaigns that GetUp does more than ignore: it feeds it in every public statement in which the plight of children in detention is emphasised. Behind the scenes, GetUp has attempted to ensure that other lawyers, advocates and friends of those detained funnel any media interviews with asylum seekers through them first and has tried to keep constituent parts of the #LetThemStay campaign firmly on the message of “kids out”. This is despite there being at least one journalist filing stories from within the Manus detention centre itself and the active social and media campaigns being run from within the camps both onshore and offshore. GetUp tells its supporters, when challenged, that it is the fault of the media that the kids out stories are being run, when in fact this is the strategy planned and currently being executed by GetUp. Quoted in December 2015 about the Ferrovial takeover bid for Broadspectrum, Shen Narayanasamy stated: “NBIA sees a European takeover as posing no hurdle to the success of its campaign to halt human rights abuses in the offshore centres”. At no stage has NBIA/GetUp stated that its campaign is to close offshore detention centres. Even within the limited framework of campaigning around only offshore centres, GetUp NBIA has only committed to “stopping abuses” which it seems to think will occur via implementation of a code of conduct. Children out and no more has been GetUp’s consistent position, they are just less honest about it now that they are under pressure from those who want more and who they see as their constituents. ANGELA MITROPOULOS: Arguments for the strategic pragmatism of only or only ever conservative positions are always interesting. Pragmatism is a question about ‘what works.’ It is not a question about what works to sustain or conserve things as they are. Nor is it a question that should elude answering the question ‘Works to do what?,’ as Liz points out. In more than two decades, all the evidence suggests that the constant preoccupation with ‘children out’ has not only been ineffective in undermining or abolishing the detention system but that it has contributed to its expansion. I don’t want to go over arguments I’ve made before, some of which are here. I did want to emphasise two additional points. The first is that legal cases should not be allowed to structure the priorities of campaigns against detention, for the simple reason that they are legal cases which seek to get around the law in narrow instances rather than campaigns which seek to change it. In this sense, the problem is less the ascendancy of pragmatism than legal positivism – ‘that detention is legal because detention is the law,’ precisely the reason why the High Court action failed in this instance as before. Indeed, the faith placed in High Court actions is remarkable given how many times those actions have failed and, even when they have won, they have quickly been circumvented by the passage of new laws. What, exactly, is the point of performances of faith in the law? The ascendancy of a religious-cultural nationalism and supremacy is, of course, not confined to Australia – it is pivotal to a new, geopolitical system of segregation that insists on religious-cultural homogeneity within each nation and justifies border controls through the purity doctrine of ‘everyone staying in their place.’ Successive Australian governments have aligned themselves with the rise of Sinhalese Buddhist nationalism in Sri Lanka and the Hindu nationalism of the BJP in India on the basis of these tenets of religious-cultural homogeneity, supremacy and segregation. Much the same can be said about the United States, and indeed the US has been crucial to the global promotion of this doctrine of national religious-cultural purity and segregation. Moreover, it is not simply that the focus on ‘children out’ implies that adults in detention are not innocent, and in doing so gives credence to arguments for the continuation of the detention system. Nor is it only that the focus on children excludes those in detention who are not parents, those who are queer, those who are deemed to be either ‘sinful’ or who, and this is much the same thing, have not followed the ‘family values’ doctrine of being converted or reproducing a pure nationalism ‘in the right way.’ That is bad enough. But as Cardinal Pell is about to testify at the Royal Commission into Institutional Responses to Child Sexual Abuse, and on the eight year anniversary of the apology to the Stolen Generations, I would have hoped there was far more critical attention given to the institutional and doctrinal fetishism of childhood innocence that, as a fetish which compounds an attitude of objectification, has routinely been the conduit of both well-intentioned concern and tremendous abuse. LIZ: The closure of the Baxter detention centre in 2007, which was emptied of family groups and children by June 2005 but still held detainees at time of closure in August 2007, literally paved the way for some of the infrastructure of the Northern Territory Intervention. The centre’s demountable buildings were sent north to “assist” with the Northern Territory intervention. Angela’s 2001 piece makes the point about those continuities. I want to pick up on the point about the contribution to expansion of detention and go through a little of what community detention is. Sanmati has already described in detail what the bridging visa code of conduct means, for those who get a bridging visa, here. I think the way that several organisations have fudged what has happened to Baby Asha as being “free” or safe, released into “community”, is extraordinary. In the face of criticism of the victory celebrations, advocates have claimed that this is what the family wants and that community detention is some kind of win. Let’s be clear. There are roughly 80 people, including families and single men and women from Manus and Nauru in Australia for medical treatment who have been placed in community detention. It has been happening before the High Court case, during the High Court case and even after the High Court case, largely on the basis of internal departmental referrals. Community detention leads to two possible paths: removal or release on a substantive visa. Dutton has made it clear that, as with all those who have already been on Manus and Nauru that it is intended that they return there. Asha is no different, though it has been reported that she is still under guard, a far more stringent type of community detention than any of these others, while community detention arrangements are made. Community detention in Australia developed from the “Swedish model” – in which women and children live in the community, while the father in the family remains in detention. This is similar to the situation Baby Asha faces at the moment – detained under armed guard. Since 2005 “residence determination” powers mean the Minister can determine that a person or persons live in premises rented for them by the settlement services provider. (The Australian Experience: Case Management as an alternative to detention) So we no longer hold the men hostage in the camp, but release the entire family into detention in community. Community detention means that a person is detained in the community, not allowed to leave the premises rented for them by the settlement services provider overnight or for more than a day without departmental approval, and not allowed to have anyone stay over. Particularly with the single men, often traumatised people are thrown together in the one premise, with no choice over who they live with. Some of the family groups have found themselves in houses with piss-stained furniture, left with no food and told by case workers that if they throw anything out (replacing piss-stained furniture with donated items from others) they could be put back into detention. With a few hundred dollars a fortnight to survive on, in reality people in community detention are surviving off charity. The settlement services are hit and miss in terms of service provision. Some are fine. But when they are not, who are you going to complain to, right? Community detention is by no means intended as a pathway to a substantive visa. Rather, community detention is intended to assist the process of obtaining medical clearance in order for people to be returned to Manus or Nauru. Without medical clearance, the lawyers can work to prevent removal through court action. And of course that’s why IHMS exists. Patch them up and pack them off. The problem with the fudging over what has actually happened to Baby Asha is that these organisations declaring victory know this to be true. But it’s more important for them to jockey for position and use their role in the campaign over Baby Asha to fundraise for and draw attention to their own organisations. These are organisations that believe that they need “good news” stories to mobilise people. What that really means is stories that make people feel good about being involved (that’s also the reason we are not supposed to talk about race when talking about the border). For these organisations, what is most important is that the people who came out to stop Baby Asha’s removal feel good and in particular feel good about the role played by these organisations. I have been kind of impressed by the resistance in some quarters to the feel-good narrative. Some noticed fairly quickly that they have been had and that this child and her family are still at risk of removal and wonder what and whom the narrative of victory serves. And as much as these organisations have tried to stay “on message” about families only (and even better, cute little girl babies), more and more people appear to be asking the question, what about the others in detention? Why not close the camps? MATT: Liz’s reference to NBIA’s claim over what lines people are willing to draw points to some rather interesting connections, particularly from the perspective of a cross border politics. This familiar trope was deployed in July last year by Australian Labor Party MP Anthony Albanese when he declared – in the context of party debates over the question of naval interdiction of asylum seeker boats – that turnbacks were a “red line we cannot cross”. That line, like so many since the ALP introduced mandatory detention, was indeed crossed, with the notable assistance of Brad Chilcott, National Director of Welcome Australia and one time policy adviser to the Minister for Immigration, as well as representatives from left unions such as the CFMEU and United Voice. Last I heard Albanese is still an ALP member so it seems the lines that actually matter to people like him are those of the party and the national border. Pragmatism is still the rule but, in contrast to what Angela argues with respect to what might actually end the practice of detention, it seems apparent that the line that won’t be crossed by the ALP, its affiliates, and allies is anything that harms the interests of their friends in the detention industry. On this note it is worth remembering that Greens policy also allows for periods of detention (up to 30 days, more with court extension), and that branches that party have been known to lobby for the re-opening detention centres. Detention with a humanitarian face might sound good to people who want to salve the consequences of their impulse to cage people seeking asylum, but it is hard to see how it is in the interests of those who find themselves caught in this vampiric system value extraction. Chilcott’s role here is significant as he articulates the confluence of interests that Angela referred to between (predominantly white male evangelist) Christian nationalists, government border policy, and organisations who stand to benefit from the adoption of alternative models of detention. Welcome Australia’s 2015 “Walk Together” march was sponsored by AMES Australia and MDA Ltd, companies who have a stake in offshore detention through their Connect consortium, as well as within Australia through their Settlement Resolution Support programs. Chilcott is also a director of Common Grace, a Christian activist organisation whose team includes Jarrod McKenna and Justin Whelan, both of whom are prominent leaders of Love Makes A Way, a children in detention focused campaign that enjoys support from ALP and Greens politicians, GetUp and the Salvation Army, a known detention contractor. It strikes me that part of the energy behind LetThemStay is derived from an international surge in a more or less social democratic sentiment. This is represented in figures such as Jeremy Corbyn and Bernie Sanders. It is entirely on point that so much of the enthusiasm for these leaders is based in a denial of their instrumental (ht Tom) and, at times, hostile positions with regards to anti-border politics. This maps quite accurately onto the investments that many LetThemStay proponents have in ignoring its connections to the detention industry, which on many occasions gives rise to heated calls for censure lest the “unity” of “the movement” be damaged. This is a dynamic that Angela has previously discussed in relation to SYRIZA’s alliance with Greek ultra-nationalists. It is worth remembering that the historical achievements of (even nominally) social democratic factions of Australian politics include suppressing and driving out Chinese workers, watering down agreements on Indigenous Land Rights and, as mentioned, the introduction of mandatory detention. The question of why particular kinds of people want to cultivate mutual relations with the detention industry is what is at stake here, and the willingness to intimidate those who dissent from this (one wonders how free detainees really are to decline propositions in this situation) adds more weight to the thesis that this is more a leftist putsch for control of the detention system and the financial surpluses it produces than anything to do with ending detention. CAROLINA LEE: Although its strategic limitations have already been discussed, I want to expand on the point that ‘kids out’ is not only a question of strategy or tactics. The mobilisation of innocence/guilt, purity/uncleanliness and saviours/sinners, as discussed by Liz and Angela, has significant consequences for the contours of the border especially for those of us that are not white. Having black, brown, yellow, Muslim and Arabic kids out of detention is ‘acceptable’ not only because they are marked as innocent and/or redeemable (from their future ‘impurity’ as non-whites or non-Christians) but also because they’ll grow up Aussie, mate. If we want to think of the children, can we think of what their lives will be like if even their ‘saviours’ hail racism and Islamophobia whilst purporting to challenge the border. ‘Kids out’ deploys the same racism and nationalism that underpins the border industrial complex. The logic of detention is that the lives of asylum seekers are worth more being degraded for the extraction of financial and political value under the banner of ‘stopping the boats’. The underlying justification is the ‘guilt’ of people seeking asylum – the ‘sin’ of mostly people of colour crossing over the borders set up by white nations. As Angela has discussed elsewhere, migration detention is also based, and valued, on what future risks detainees are perceived to pose. We can’t challenge the criminalisation of asylum seekers if we insist on the innocence of children. This form of racism maps onto the history of seeing darker-skinned people as inherently dangerous, guilty, deserving of punishment and sub-human. In this country, this history includes efforts to eliminate Aboriginal people through extermination, assimilation, and the forced removal of children – a policy that continues to this day. Save the children, f* the women, kill the men and the queers: this colonising strategy is also at play within the border industrial complex – and where ‘progressives’ with allegiances to white nations play their role in ‘saving the children’. And then they expect to be thanked for their ‘solidarity’ campaigning for an ‘achievable win’ on mandatory detention. Rather, with their work on #LetThemStay, GetUp! bargains for a ‘win’ through the spectacle of (white) ‘progressive’ politics. GetUp! does so by signalling to politicians and corporations that it will not challenge the categories of people who can continue to be detained, or by actively reproducing these categories as legitimate distinctions. There is a difference between professionalised activists ‘cutting an issue’ like mandatory detention into a smaller issue that is winnable, and substituting the issue of ending detention to ending it for some or making detention ‘nicer’, as Matt has discussed. If we do not challenge the racism and nationalism that greases the supply chains of the border industrial complex, we continue to be part of maintaining the system through ‘anti-detention activism’ as much as working or investing in detention. And the illusion of ‘progressive’ politics whilst participating in racist frameworks empowers racists within the border too. SANMATI & AHMED: The language of pardon/mercy implied in LetThemStay is entirely consistent with the generally punitive dynamics of the asylum regime which mandate mandatory detention – that’s the only way to understand why detention contractors can legitimately support LetThemStay. The fetish of asylum seeker passivity as objects of compassionate action and substitution of agency is also entirely compatible with a model of deterrence that informs offshore detention. We know what’s best for them and always have, even when they don’t know. We also wanted to speak about the mysticism of the “267” – who are they? The media from HRLC and GetUp speaks of children and parents. Privately they say it includes the entire cohort of “transferees” including single women and men from Manus, and yet a “strategic” decision has been made to disappear Manus from the campaign. Because Manus is the bedrock of punitive deterrence on which the imaginary of this entire campaign is based. The fetish of the passive asylum seeker, the proper object of compassionate action is ultimately the subject of human rights in general. The asylum seeker rendered immobile, not challenging, as Carolina says, of the borders drawn for them by white people, is the fantasy object for a people insecure about the integrity of their sovereign borders. Particularly the type of asylum seeker rendered the “the queue jumper”, the active asylum seeker who refuses to stay at her designated place of death. The mysticism of the “267” plays into the binary of those who receive human rights and those who grant human protections, the active and passive agents central to the savior complex fantasy. The subjectivity of this passive, abjected figure of asylum is constituted in contradistinction to the citizen who is able to exercise its legitimacy by finding itself on the side of sovereign power. In this sense, the tragic, but dangerous dimension the pragmatism of this campaign has brought to the fore is that it is no longer the state, the sovereign exercise of power, that has the capacity to decide on who should be allowed to live and who should (let) die. The people, by letting sovereign power set the limits on what is possible participate in that decision-making, lending their humanity in the service of deciding on the exception. TOM: The participation of detention supporters and profiteers in movements such as #LetThemStay immediately limits their political demands. This capitulation is reframed as a falsely named “pragmatism” (the same to which Angela refers) that allows them to “grow” and “build”—that is, to incorporate and grant a leading role to organisations that should be their material antagonists. The subsequent narrowing of demands functions through a range of predicates laden with white paranoia and racism: among them child/adult, families/individuals, abusive/fair, detained/deterred, or in the case of #LetThemStay, onshore/offshore. Leading figures of #LetThemStay have shown, along these lines, a disciplined restriction to the question of the “267” asylum seekers under threat of transportation back to Nauru and Manus. This delineation can be traced through the rhetoric of the State Premiers who have supported the movement, the Twitter timelines of Brad Chilcott and Welcome to Australia, and the web of cross-promotional activity taking place online between GetUp!, Save The Children Australia, and Unions Australia. These groups are all making many public statements without calling the continuity of detention into question. Unsurprisingly they’re enforcing their own material and political interests from within the campaign. Dan Andrews’ testimony is indicative. He discovers for us (as Australians must always feign being on the point of discovering) that migrants are human beings, once you “take the politics out of this sad situation”. Supporting #LetThemStay cannot “undermine federal Government policy”. After all, “these children and their families aren’t some theoretical group of people overseas waiting to come to this country.” The erasure is palpable. It’s the bipartisan political agreement on mandatory detention, vessel turn-backs and third country resettlement, finalised at the ALP national conference of July 2015, that enables Andrews to support #LetThemStay without career risk. For others like Brad Chilcott and Peter Dutton, the resulting regulation of migration flows is a platform permitting an increase in spot “intakes” of refugees, subject to racial and religious triage. The sense of unreality accompanying a large mobilisation in pursuit of increasingly narrow demands reached a peak on Monday when #LetThemStay supporters celebrated collective redemption as the government temporarily moved Asha from one form of detention to another. As Angela and Carolina point out, such moments may have a perverse resonance for the Christian supporters of these campaigns—if so it has been belied straight away. GetUp! ended up declaring “We Won!” in almost the same breath as Peter Dutton stated Asha would soon be returned to Nauru. During the public response to the High Court’s decision, the sophistication of the state’s “integrated and layered” view of the flexible repertoire of policy, law, commerce, diplomacy and geography that is the border has been on display. Dutton’s “humiliating backdown” was probably a well-rehearsed manoeuvre after exhausting the respectable stamina around the Lady Cilento blockade. The ruling of the High Court bench was itself guided by timely, coordinated infrastructural and legislative changes, demonstrating the resilience of what has been implemented. 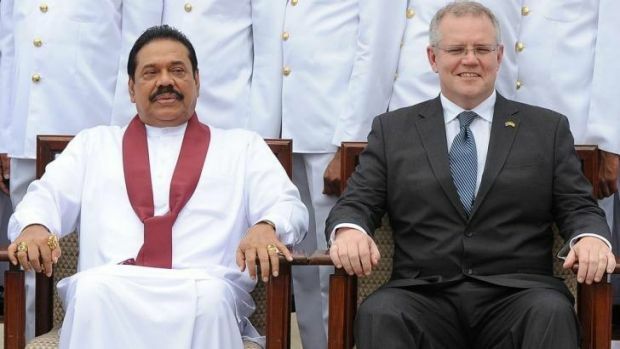 Meanwhile, Dutton confirmed on Tuesday that within the past fortnight a vessel from Sri Lanka had been intercepted, those on board submitted to fast-track asylum claims assessment—with a 100% failure rate—and the vessel turned back. Nationally focused activism is barely able to think the lives of people turned back or deterred by the border regime. In the same statement, Dutton alluded (with racist menace) to 14,000 people currently stuck in limbo in Indonesian camps. These are people already embedded in a layer of the “continuum” of the Australian border—and what can #LetThemStay do for them? ANGELA: I also want to underscore the sense in which it is, quite frankly, appalling that anyone would try and claim that campaigns against detention should be accommodating of (prospective) players in the detention industry and those who campaign for turn-backs while, at the same time, ignoring the repeated calls of those in detention to not be abandoned by cherry-picking legalism. Such arguments are deserving of nothing but contempt. If organisations are not against detention then they have excluded themselves from campaigns against detention. Is it really not that obvious? I look forward to those who have accused some of us of being “ultra-leftist” on this point of moving a motion at their next union branch meeting to allow employers to become union members. If not, then I can only surmise that the accusation does not in fact concern degrees of radicalism but refusing a tacit ‘Australians First’ idea of politics and solidarity. It’s also the case, after a series of successes in the divestment and boycott campaigns over the last two years, that #LetThemStay marks an attempt to limit those successes so as to relaunch the usual, ineffective ‘strategies’ that we have all seen rolled out for more than two decades, and whose effects should be obvious to everyone who cares to think about whether or not campaigns are ‘pragmatic’ or effective.